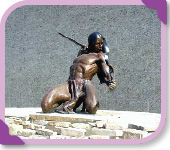 “Strength of the Maker” was created by Colorado artist Denny Haskew and depicts a Native American man bending a bow across his back. 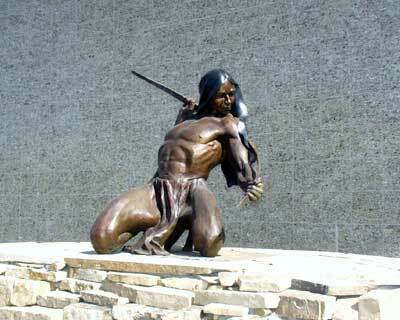 The bronze sculpture is meant to represent the strength of a higher power that created nature and man. It measures 60 inches high and 60 inches wide including the bow. Haskew, a member of the Potawatomi citizen nation, is known for creating art that reflects the Native American and southwestern culture. His work has been described as intensely personal and honest, reflecting recurring themes of spirit, love, forgiveness, healing, endurance and strength. Haskew has another piece, “Luminaire,” located at the Transpacific Development Company office building in the Cerritos Towne Center. A limited edition of the “Strength of the Maker” sculpture has been selected for permanent display in the Native American Museum of the Smithsonian Institution in Washington DC. It has won five best of show or first place prizes in the top art shows in the country.